The overwhelming majority of the Greek people are being called on in this period by the "left" government to pay an unbearable property tax, which had been introduced by the previous government. This is a tax that has been kept in place and intensified by SYRIZA, despite its pre-election promises to abolish it. And it is precisely this period that the Prime Minister, A.Tsipras chose to spread new illusions amongst the people, by supporting with gusto in an interview with the newspaper "Real News" the fairytale of supposedly "just" development. He also seeks to utilize the upcoming meeting of the leaders of the EU's Mediterranean countries, which he is convening in Athens, in this direction. He said, when explaining the goals of the attempted coordination of the states of the "South" on behalf of their bourgeoisies, that the aim was to push for the transfer of funds to the periphery in order to support the capitalist recovery and the way out from the economic crisis. And he noted: "We do not want to be the poor periphery of the EU, we want to be a new centre, with an agenda and positive proposals for development and social cohesion." 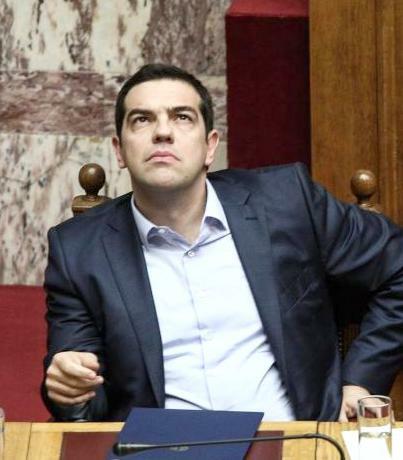 In addition, A. Tsipras highlighted the issue of the "adjustment" of the Greek debt and the reduction of the budget surpluses, which he had already agreed to with the imperialist institutions, presenting all the above as the beginning of a solution that will allegedly be in the people's interests. At the same time, he conceals the new measures, which aim to even further cut the social and labour rights and gains of the people. "Mr Tsipras is calling on the Greek people to patiently endure the anti-people measures that he is burdening them with, on top of those taken by ND and PASOK, in the name of some adjustment of the debt, which the people will continue to pay for, some reduction of the surpluses, which the popular families will continue to be sucked dry for, some recovery, which will only be for the profits of the few. The new fairytale of Mr Tsipras can no longer convince the people, as they know that they will once again be the losers, while the only winner will be capital."